Orkney Golf Club was the venue for the latest KDDL ranking points competition, which saw 37 players enter the Pit Stop Singles on Friday night. There was a good mixture of A and B players entered, and as always, players were all keen to win those ranking points which go towards making the team to play against Shetland, and the East V West later in the season. 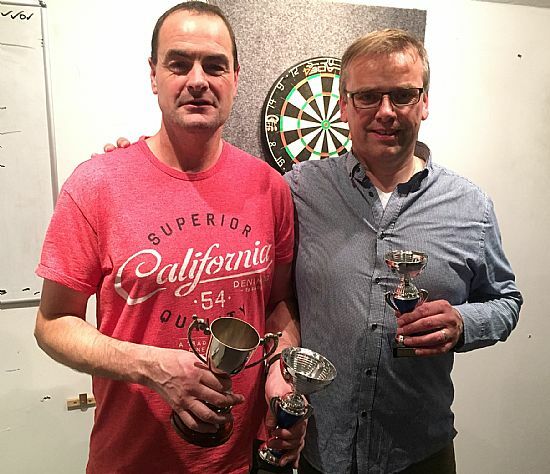 At the semi-final stage, Robbie Stanger beat Derek Firth to book his place into the final, while Ivan Leslie beat Leigh Shearer to progress. The final was a classic and very close encounter with Ivan throwing to victory by a -5-4 scoreline in the best of 9 leg match which could not have been closer. It was also good to see so many players staying behind to watch the match. Five ton plus finishes during the night by Ivan, including two in the final undoubtedly helped him along the way. The next ranking points competition is set to be held in the Legion on Friday, November 24, with the Jim Scollie Masters. The leagues are now just over quarter of the way through the season and already the Legion have given themselves a bit of breathing space in the Williamsons ‘A’ league, opening up a six point lead at the top following a resounding 11-1 win away to Quoyburray ‘B’. The Commodores moved clear into second on game difference by winning both games they played this week. Firstly by a victory over the Untouchables by 8 games to 4, and later in the week narrowly defeated the Warriors 7-5. This was also the Warriors second appearance of the week, having already overcome Quoyburray 10-2 on the Monday night. Result of the week surely goes to the Legion Arrows, with Cammy Scott leading his side to a terrific point against the much-fancied Orkney Golf Club. It goes to prove the point that when all members of any team all click at the same time, any result is possible in this league. Despite being only their first point of the season, it was enough to lift the Arrows out of the relegation zone, if only by virtue of having won more games while level on game difference. The two Quoyburray teams now sit in the drop zone, with the Quoyburray two games worse off on game difference than both Quoyburray ‘B’ and Legion Arrows. The top of the ‘B’ league continues to shuffle more than a pack of cards! Tankerness moved from third to pole position with a decent 9-3 win over bottom placed Ale Stars, who continue their hunt for that elusive first point. The dastardly Bilco Boys continue to wreak havoc with both ends of the table. Having drawn with sides at the top and bottom in recent weeks, they decided to upset the apple cart once more and scraped out a narrow 7-5 win over Murray Arms, who had been top at the end of the previous week. The Nomads squeezed into second place with an 8-4 win over promotion chasing rivals the Vikings, while at the bottom end of the table, Sanday ‘B’ just edged the Young Loons 7-5 in yet another close result for the youngsters. Streamline maintained their mid table spot in the league with a 9-3 victory over Sands, and now appear to also be an outside contender for a promotion spot. It really is anyone’s guess as to how this league will turn out by the halfway point of the season. 180s this week were hit by: Graham Firth, Allan Brown, Keith Brumpton, Andrew Rendall, Raymie Rendall, Colin Kirkpatrick, Derek Firth, Gary Chalmers, Erlend Lennie, Craig Moar, Neil Drever, Robbie Norquoy, George Low, Robbie Stanger, Nicol Gray, Gary Wilson, Leigh Shearer, Eddie Drever (two), Brett Dickinson (two), Kevin Gray (two) and Stevie Moar (three). Craig Moar also hit a 171 while Freddie Tait had a 177. Ton-plus checkouts came from: Gary Wilson 100, Gary Chalmers 100, Steven Low 102, Eddie Drever 106, Derek Ward 107, Allan Brown 114, Lee MacPherson 115, Brian Moar 118, Ian Linklater 120, Freddie Tait 124, Kevin Gray (101, 101 & 118), Robbie Stanger (116, 116, 117 & 121) and Ivan Leslie (101, 117, 119, 130 & 139). A league: Commodores 8, Untouchables 4; Quoyburray 2, Warriors 10; Quoyburray 1, v Legion 11; Legion Arrows 6, OGC 6; Warriors 5, Commodores 7. B League: Young Loons 5, Sanday ‘B’ 7; Sands 3, Streamline 9; Nomads 8, Vikings 4; Bilco Boys 7, Murray Arms 5; Tankerness 9, Ale Stars 3. A League: Commodores v OGC; Quoyburray v Untouchables ‘A’; Quoyburray ‘B’ v Untouchables; Sanday v Warriors; Legion v Shapinsay; Wanderers v Legion Arrows. B League: Young Loons v Ale Stars; Sands v Muppets; Nomads v Sanday ‘B’; Bilco Boys v Streamline; Vikings v Murray Arms; Tankerness – No Game.